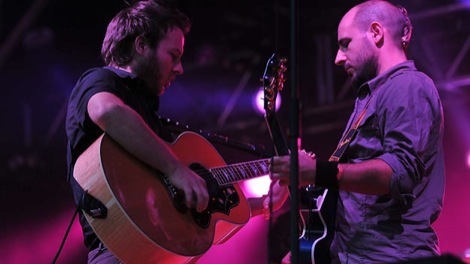 The venues may be getting smaller, but Turin Brakes still know how to make a big noise. Getintothis Karl Grubb laps up another fine night at the Kazimier. I have to declare a bit of bias here: Turin Brakes have been the soundtrack to many a summer’s barbeque, long drives, ipod on the way to work. I’m a bit of a sucker for close harmony vocals and acoustic guitars, so it wasn’t exactly a chore to make the trip from my new abode over the water. A couple of things to mention: firstly, the venue – on my first outing to the Kazimier, I could understand why it has long been championed by Getintothis – it’s great – cheap beers, intimate and a fantastic sound setup. The support act, Andy Steele and friends were not just some local band chucked on stage to fill in a bit of time, but a melodic, gaelic-sounding combo backed by keyboards and Helen Maher‘s accordion – think Waterboys‘ circa Fisherman’s Blues and you’re halfway there. Just time for a quick beer and Olly Knights and Gale Paridjanian hit the stage with little preamble and open up with The Sea Change, by far the standout track, from their latest album from Outbursts. The two of them were backed by tight drums and an excellent bassist who looked like a cross between Cat Stevens and Charles Manson. Rattling through some of their best stuff early on – Mind Over Money, Stone Thrown, Feeling Oblivion; the boys were playing to a crowd that welcomed their long overdue return to Liverpool – as a jam broke out on stage with Olly singing lyrics to that effect. Cheered on by an increasingly enthusiastic audience, eight more songs followed including Painkiller, Fishing for a Dream and a return of Jet Trail – not performed live since 2001, before wrapping up the set with Long Distance – a nice anthemic end. Their first encore was a nice touch – back to the stage performing an unplugged rendition of Mirror, before closing with a cover of Neil Young‘s Everybody Knows This Is Nowhere. After a promising start to their career Turin Brakes failed to capture their commercial potential, but tonight they emphatically proved that as a live band, they can still hold their own. The venues may be getting smaller, but they’re still packing them in and making everyone smile.